This chapter describes how to customize think-cell, i.e., how to change default colors and other default properties. The first sections describe creating and loading a style file and explain how to deploy it in an organization. An understanding of these tasks is required in any case. Afterwards, you may either follow the Style file tutorial to create your own style file or go through the format reference in Style file format. A dedicated XML editor will typically highlight errors in your document, and with a keyboard shortcut such as Ctrl-Spacebar you can trigger auto completion: the editor will offer a choice of tags, attributes or values applicable to the current context (position of the text cursor). If you move the mouse over highlighted errors, you will get a tooltip with a detailed explanation of the error. 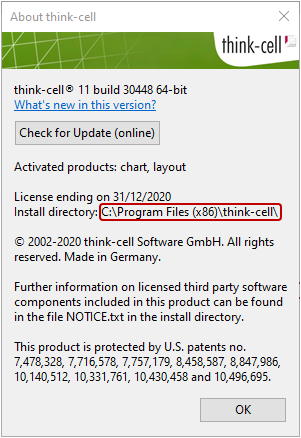 Several sample style files are delivered together with think-cell and you can find them in the subfolder styles in the think-cell installation folder. First, find out the location of the installation folder. It is shown when you click About in the More menu. Make sure that there are no warnings or errors indicated before you save an edited style file. Of course, any other editor that supports XML also works. The file needs to be saved with an .xml extension. To load a style file, choose Load Style File... from the menu More. In the dialog, navigate to the folder with the style file, choose the file and click Open. It is used for any new charts in the current presentation. 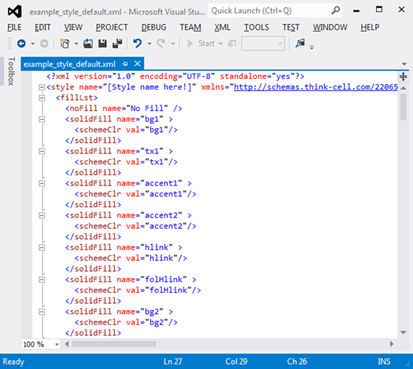 For example, after you load the sample style file example_style_complex.xml from the styles directory in think-cell’s installation path, the color and color scheme property controls will include customized items. If you want to apply a style’s colors or color schemes in existing charts, you need to do so manually. Load Style File... loads a style file into the master slide of the current presentation. When the presentation is distributed as a PowerPoint template, the think-cell style is implicitly distributed as well. It should not be necessary to give a think-cell style file to individual users. 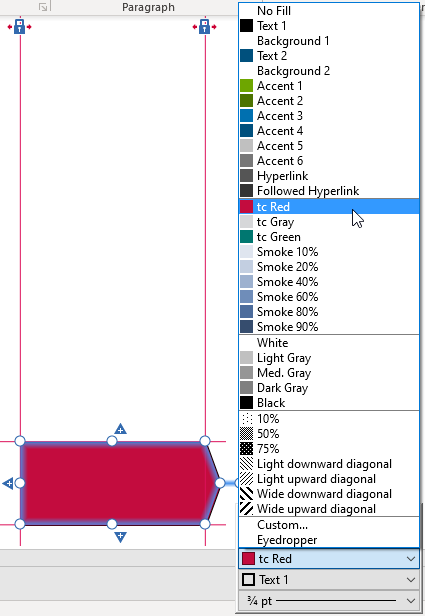 Switching between styles is accomplished by switching between PowerPoint templates. Make a copy of generic style.xml and load it into an XML editor (see Creating a think-cell style for choosing a suitable editor). Walk through the file from top to bottom making the changes described in the following steps. Remove any unneeded colors from the list inside the fillLst element. 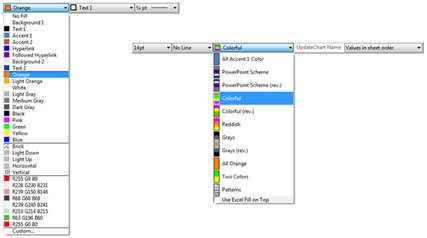 You will find solidFill, pattFill and separator elements corresponding to the items in the color list displayed in think-cell (see Color and fill). To remove, e.g., a solidFill element, remove everything between and including the opening tag <solidFill ...> and the closing tag </solidFill>. Optionally, create a new section for your own colors. To do this, insert a separator tag by writing <separator/> at the appropriate location in the color list. Also, feel free to use line breaks, indentation and empty lines to structure the XML code in the style file for your own convenience. Spaces and linebreaks have no effect on the resulting style. Remove any unneeded color schemes from the list inside the fillSchemeLst element. You will find fillScheme elements corresponding to the items in the color scheme list displayed in think-cell (see Color scheme). To remove a fillScheme element, remove everything between and including the opening tag <fillScheme ...> and the closing tag </fillScheme>. Note that you can only use colors that have been defined in the fillLst section (see steps 3.-5.) above. In particular, if you removed any colors in step 3., you must remove those colors from the color schemes, too. Save the modified style file, load it (see Loading style files) and test it. Deploy the new style in your organization as described in Loading style files. In particular, it is not necessary to send the XML file to your colleagues, but you should of course keep it for your own reference. The think-cell agenda can use a specific custom layout in your presentation to define the agenda position and other shapes on an agenda slide like headers or pictures. By adding this custom layout to a template, you can define these settings for a whole organization. 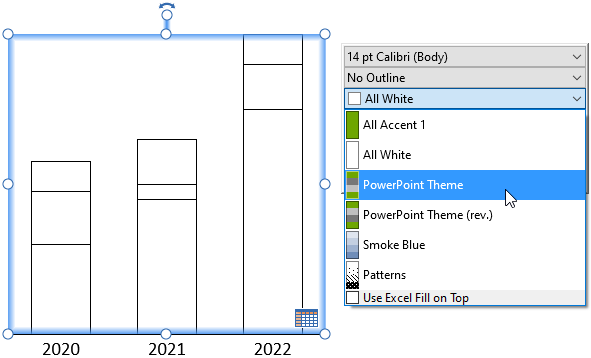 In PowerPoints slide master view, create a new custom layout. Typically, you will duplicate one of the existing custom layouts that best match the desired look of a think-cell agenda slide. Name the new custom layout “think-cell agenda”. think-cell will only use this custom layout, if it exactly matches this name, which is case-sensitive. Only include shapes on the “think-cell agenda” custom layout that should appear like this on every agenda slide. While editing the custom layout, choose Agenda Placeholder from the Elements menu. This element is only available when editing a custom layout. It adds an agenda placeholder on the current custom layout. Choose the agenda placeholder position as described in Placing the agenda. When a custom layout created this way and named “think-cell agenda” is found in the current presentation, Chapter will use this custom layout, including any additional shapes on it and place the agenda at the pre-set position.